Here are my Pros and Cons of Marriott Rewards based on the developments during the past 12 months. Like was the case last year, there hasn’t been too much developments in the program compared to Hilton, Hyatt or IHG. The official qualification criteria for Marriott Gold and Platinum status are high, although there are many tricks to get them both on fewer stays. You can access Marriott Rewards web page here. What do you think about Marriott Rewards? Leave your comments below. – No properties in popular vacation spots like Maldive, Seychelles, French Polynesia etc. Marriott has brands from motel type Fairfield Inns to Luxury brands such as Ritz-Carlton. Marriott purchased South Africa based Protea Hotels back in 2013 that will be integrated to Marriott Rewards this year. Marriott’s coverage in Africa is acceptable (compared to other chains) after this. Marriott tends to be the same Marriott pretty much anywhere you go. The brand consistency is high. The travel package award option is a very good one, but requires high number of points. You redeem for airline miles and a week along hotel stay. You don’t have to spend the miles at the same time, however. They are just deposited to your chosen frequent flier account. You can read more about Marriott Travel Packages here. I was positively surprised about Marriott Rewards customer service email turnaround time. I had couple of issued that needed to be resolved. The email reply came usually within an hour after opening a ticket on Marriott.com. 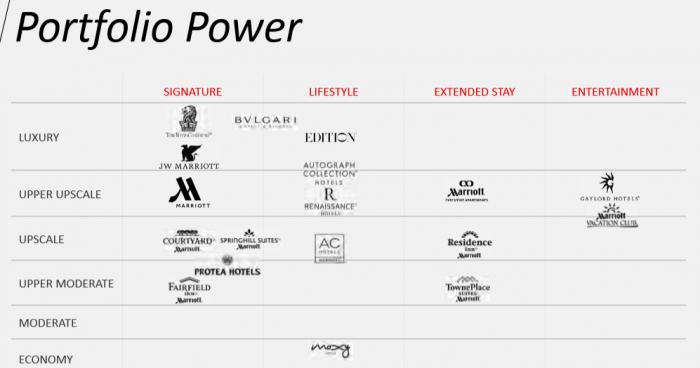 Most major corporations have agreements in place with Marriott for negotiated rates. Most of the other chains only have four status levers, but Marriott has four; Silver, Gold, Platinum and Platinum Premier. Gold and Platinum elite members have service guarantees in case of being walked or downgraded. This makes walking or downgrading and elite member very expensive for the property. Platinum members are also entitled to cash compensation if the property fails to deliver their Platinum amenity. This is quite rare among the programs to have such strong guarantees. You can read more about elite guarantees here. Marriott properties are usually very good at problem resolution and compensation at the property level without having to escalate issues to corporate. Marriott and United launch reciprocal benefits for each others elites. Marriott Platinum members get United Mileage Plus Silver status. You can read more about this partnership here. Although the North America is Marriott’s stronghold, they do have presence in most major international markets and business/financial centers. Marriott has been signing independent hotels that get to keep their local identity & heritage under he Autograph Collection brand. I stayed at one of these hotels in Edinburgh and you can read my take on the Glasshouse hotel here. Marriott Rewards has number of different award types from travel packages to seasonal awards. Marriott Rewards has number of discount promotions and elite fast track offered for Marriott Rewards members in the Asia Pacific region. There are quite a few ways to save on Marriott stays like using promotional code LPR and NPR (when you are eligible for the rates). Marriott’s best rate guarantee is straightforward and you get 25% discount of the lower price that you found. Properties get penalized for offering lower rates via third party channels. Once you have qualified for Gold or Platinum, you can essentially use Buy Back he promotion yearly to buy back the status using points. Marriott has well defined lifetime status program that is quite easy to achieve for a heavy business traveller. You can read more about lifetime status here. The number of airline partners that Marriott Rewards has is high. Most of the yearly promotions are targeted based on your past stay history, but Marriott allows you to switch to a promotion that better fits your needs. You can read more about switching targeted promotion here. Marriott has been running the same promotions now for several years in a row with minimal modifications. Marriott has promotions few times a year for miles, Marriott Rewards points, or bonus cash loaded to a Marriott gift card purchases. You can often easily save 10% by buying Marriott gift cards and then using them to pay for Marriott stays. Marriott is the only hotel company, that I know of, which has its rewards customer service lines only open during weekdays and even then only during business hours. I normally only have time during the weekends to go through issues that I may have had and getting a live person to fix them is not possible. Marriott doesn’t have exciting brands and the main Marriott brand is dull. There are quite a few very old Marriott hotels that should be either completely refurbished or reflagged/rebranded. Marriott and Ritz-Carlton are effectively same, but you cannot have both account at the same time. You can call to Marriott Rewards and have them switch you back and forth between Marriott and Ritz-Carlton rewards as often as you wish. They must have deemed that the lower Marriott brands would have tainted the exclusively around the Ritz-Carlton and thus decided to keep them “separate” programs. Marriott has their own Marriott Rewards Insiders forum that they prefer over ones that they don’t have control over. Also, the person that occasionally posts on outside forums seems to lack basic understanding of communications. 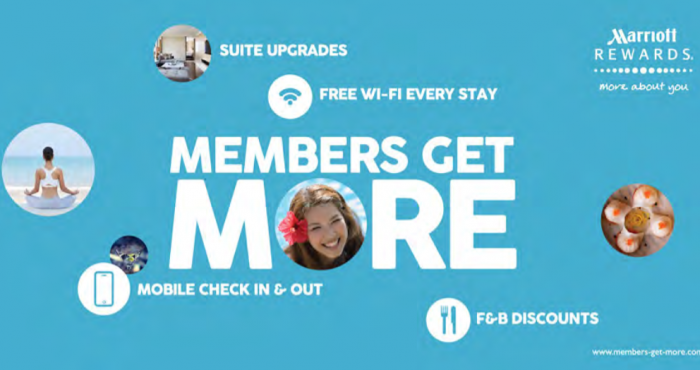 Marriott has higher requirement for elite statuses compared to other chains. The base level silver requires 10 nights, Gold 50 nights, Platinum 75 nights, and Platinum Premier 125 nights. You cannot qualify based on number of stays. There are often changes to the program that are not properly communicated. The program may discontinue award types without giving any proper notification like mass email to all Marriott Rewards members. No properties in popular vacation spots like Maldive, Seychelles, French Polynesia etc. Marriott Rewards is not the right program is you prefer having high value inspirational awards on high end vacation spots like French Polynesia, Maldives or Seychelles. Marriott doesn’t have a single property on these three countries for example. The category creep has made city center hotels in place like Rome very expensive award vise. Many Marriott Rewards members choose the free night certificate option during the MegaBonus rounds. Seems that Marriott has now discontinued this option. Marriott really lacks the proper venue for customer service issues unless you can resolve them at the property level. I have learned that only way to really fix an issue is to contact the Mr. Marriott’s executive office. They seems to have problem solved overnight, however. This is both positive and negative at the same time. Marriott has run the same MegaBonus as far back as I can remember. Maybe it would be time to offer something different? You don’t get stay or night credits for award stays like you do with Hilton or Starwood. Some may argue that there is very little difference between Gold and Platinum and this is certainly true for North American properties. Gold gets you lounge access and complimentary internet access. Platinum only gives you the platinum amenity and occasional better upgrade. If you are staying at a full service brand that has a lounge but which is closed during the weekend, they are not required to provide you with a breakfast. The resort locations are not required to provide breakfast at all based on the Gold or Platinum elite status. Marriott Rewards Gold and Platinum members are now eligible for a complimentary breakfast at a restaurant, when the lounge is closed during the weekends, at full service properties (some exclusions). Read more this here. This is extremely misleading and borderline fraud. Marriott Rewards doesn’t have any system wide blackout dates, but individual properties can have them and they can be for months. Marriott is the only company that doesn’t have a toll free telephone line to their Rewards Customer service in the United States. How cheap is that? Hilton, SPG, Priority Club and Club Carlson (and Hyatt starting in 2014) all have true cash & point awards. You can secure your room by using partly cash and points. These are considered awards. But in Marriott’s vocabulary Cash & Points just means that you can have nights that are paid and nights using points on the same reservation and nothing else. Read more about Marriott Cash & Points awards here. Marriott doesn’t guarantee a late check out even at the Platinum level. Hyatt Diamond, Starwood Platinum and InterContinental Royal Ambassador all guarantee 4PM late check out that is not subject to availability. Marriott’s brand standard doesn’t require lounges to be open during the weekends and many are closed especially in the North America. There is nothing with the Marriott Rewards per se, but my personal believe is that they should spice it up a bit. There hasn’t been anything “industry leading” coming out from them for a very long time.